If conservative treatments don't relieve herniated disc pain, a minimally invasive surgical procedure may help. A herniated disc is more likely to cause pain than a bulging disc because it’s more likely to come into contact with the nerves in the spinal canal. Your vertebral discs are the small, doughnut-shaped objects located between each of the vertebrae in your spine. Healthy discs provide cushioning between your vertebrae and allow for proper movement and bending of your spine. The discs also keep the openings in the vertebrae through which nerves exit the spinal canal—the vertebral foramina—open. Damaged or herniated discs, along with arthritis and spinal stenosis (a narrowing of the spinal canal), are common culprits of chronic low back pain in older adults. “As we age, discs can lose some of their water content and dry out; this is part of the degeneration process. In some cases, there is a weakness in the outer part of the disc that may lead to a bulging or herniated disc, which can result in a pinched nerve that causes pain in the back and/or into one or both legs,” explains Eric Elowitz, MD, a neurosurgeon who specializes in minimally invasive spinal surgery at the Weill Cornell Spine Center. According to Dr. Elowitz, an MRI is the test of choice to evaluate discs. An MRI shows if there is disc degeneration, loss of disc height, or a bulge or herniation, and how these conditions may be affecting the nerves. In patients who can’t have an MRI, a CT scan is used. A bulging disc protrudes past the edges of the vertebrae between which it is sandwiched. 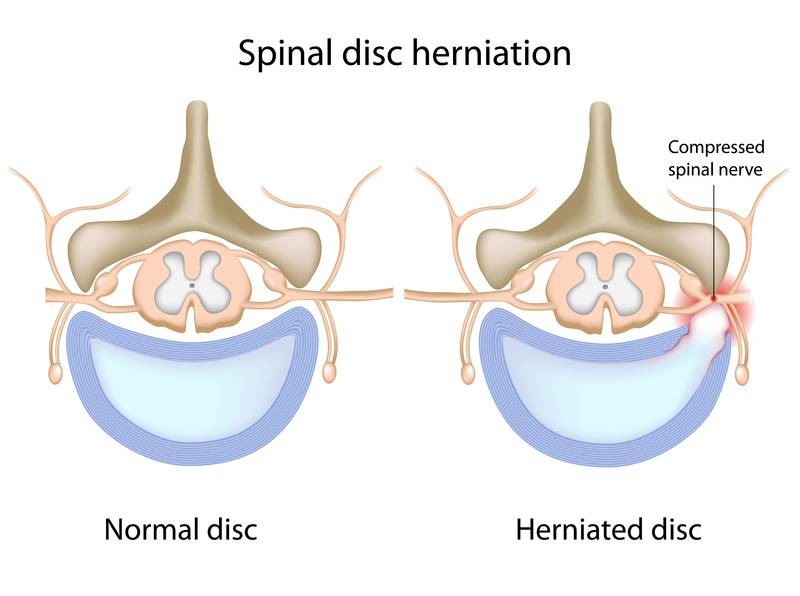 If a disc is herniated, one specific area of the disc protrudes much further. A herniated disc is more likely to cause pain than a bulging disc because it’s more likely to come into contact with the nerves in the spinal canal. For back pain that is not caused by severe nerve injury or damage, Dr. Elowitz says that first-line treatment includes conservative options, which may involve physical therapy, medication, and complementary modalities such as chiropractic and massage. If these methods don’t work, then surgery may be an option. “I always ask patients how their pain is limiting their activities and their quality of life. If limitations are mild, surgery may not be needed, but if their limitations are severe, surgery may be a reasonable approach,” says Dr. Elowitz. You may have heard that back surgery often fails to relieve back pain. Dr. Elowitz says that there is a very high degree of success when the correct procedure is performed by an experienced surgeon. The surgeon needs to determine which findings on the MRI match the patient’s symptoms and the best way of treating those findings; this is why it is so important to work with a surgeon who has extensive training in diagnosing and treating spinal conditions. If you’re considering surgery for a bulging or herniated disc, seek out a doctor at a facility that provides state-of-the-art care. Take all imaging results, including MRIs and X-rays, to your appointment. “Patients should bring a list of questions to the surgeon. Ask if there are any minimally invasive options that are appropriate for your condition; a minimally invasive procedure causes less trauma and has a lower infection rate and a quicker recovery time than more invasive options,” advises Dr. Elowitz. Common procedures for low back problems are lumbar microdiscectomy, lumbar microlaminectomy, and lumbar fusion. In these procedures, the surgeon makes very small incisions and uses computer-aided guidance to find and fix the problem. “A lumbar microdiscectomy is performed to remove fragments of a herniated disc,” explains Dr. Elowitz. “The procedure often is completed within 30 or 40 minutes. Patients are up and walking around within a few hours, and most patients can go home the same day.” Many patients are able to return to work within a few days. A lumbar microlaminectomy relieves pressure on one or more nerve roots in the lower spine area. It involves removing the section of the vertebra that covers the spinal canal to make more room for the nerves. Lumbar fusion involves joining two vertebrae together. arthritis, back pain, back problems, back surgery, bulging disc, chronic low back pain, herniated disc, infection, low back pain, massage, pain, pain in the back, pinched nerve, recovery, spinal stenosis. Diet and exercise also play important role.